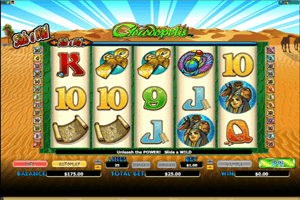 Grab your things and your digging tools because this 5-reeled video slot machine will take you to the deserts of Egypt so you can dig up the treasures of the pharaohs and claim your share. The game is themed around Crocodopolis, one of the gods that used to be worshipped in ancient Egypt. This is why one of the symbols, and the highest paying symbol of the game is presented by the Crocodile Pharaoh God. Crocodopolis is a video slot machine that has 5 reels and offers players a total of 25 paylines that they can place their wanted bets on. Players can place these bets under the reels by choosing how many lines to activate, the value of the coins and the coins per line. They can also click on Max Bet to place the biggest one available. The symbols that will start appearing on the reels include a scroll, a golden ankh, the desert, a pyramid, the crocodile god and other ancient Egyptian inspired symbols. The pyramid is Crocodopolis’ scatter icon that will give out multiplied rewards as well as triggering 12 free spins. During the 12 free spins, any winnings earned will be multiplied by a 2x multiplier. As for the crocodile god, he is the wild symbol and he shows his generosity as a powerful god by substituting for any other icons with the ability to double them if the 2X multiplier appears on the symbol. It will not substitute for the Pyramid symbol.